At first glance, what's most striking in Ryōgi Shiki are her spartan lifestyle and a penchant for classy wardrobe. She is a silent and emotionless girl who, every day after work, returns to her sparsely furnished room and lets seconds of empty existence slip away. Things were not always like that. Not when Shiki was still within Shiki, when her eyes hadn't yet seen enough death to discover its seed in everything alive and when she was still balancing on the thin line between love and murder. 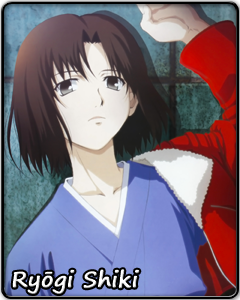 Trying to understand who Shiki is now, we must look deep into her past and discover ever darker secrets. What does it mean to be alone? This was something Shiki had never felt before her self was torn apart. Now she ponders this question over strawberry ice-cream – each bite of the treat fills a part of the temple of void within her, defining her anew. Is an empty existence a curse, if it knows no emotion? Is it a blessing, if it holds the potential to become anything it wants to? Ryōgi Shiki moves forward. She latches onto her desires to survive. She discards the parts of herself that hold her down. She experiences life: kindness and cruelty, sadness and joy, love and despair. She will continue to experience them until, one day, she is whole again.